Sir Michael John Cullen KNZM (born 5 February 1945) is a former New Zealand politician. He served as Deputy Prime Minister of New Zealand, also Minister of Finance, Minister of Tertiary Education, and Attorney-General. He was the Deputy Leader of the Labour Party from 1996 until November 2008, when he resigned following a defeat in the general election. He resigned from Parliament in April 2009, to become the deputy chairman of New Zealand Post from 1 November 2009 and chairman from 1 November 2010. Born in London, Cullen emigrated to New Zealand while young. He attended secondary school at Christ's College in Christchurch, and achieved an MA in history at Canterbury University. Receiving a Commonwealth Scholarship he then gained a PhD in social and economic history from the University of Edinburgh. From 1971 to 1981 he was a lecturer at Otago University, with a term as a Visiting Fellow at the Australian National University from 1975 to 1976. On 16 December 2009, he received an honorary LLD from the University of Otago in recognition of "his contributions as an Otago academic and as a respected and highly influential politician". In the 2012 Queen's Birthday and Diamond Jubilee Honours List, Cullen was appointed Knight Companion of the New Zealand Order of Merit. Cullen joined the Labour Party in 1974, and served on the party's Executive and Council between 1976 and 1981. In 1981 he was elected MP for the Dunedin electorate of St Kilda. When Labour entered government in 1984, Cullen became Senior Whip. Due to his knowledge of economics, Cullen became increasingly involved in the disputes surrounding the Minister of Finance, Roger Douglas, who supported the liberalisation of trade and the sale of state assets plus deep tax cuts. These goals, which were against traditional Labour policies, angered both party members and the public. When the Prime Minister, David Lange, attempted to limit the influence Douglas had on the government's direction, Cullen became involved on Lange's side. After Labour's re-election in 1987, Cullen was made Associate Minister of Finance (an attempt by Lange to provide an anti-reform counterbalance to the radical Douglas) and Minister of Social Welfare (an attempt to limit the impact of the reforms in that area). Eventually, Douglas was forced to resign, but a month later the political controversies around the dispute prompted the resignation of Lange himself. Douglas was succeeded as Finance Minister by David Caygill, one of his allies (albeit a considerably less radical one). Cullen was made Associate Minister of Health, again to reduce the effect of reforms on that sector. When Labour lost the 1990 election (something attributed by many people to public anger at Douglas' reforms, and disarray within the Labour Party), Cullen returned to being Labour's spokesperson on social welfare. The following year, he replaced David Caygill as the party's chief finance spokesperson. When Caygill retired from politics in 1996 Cullen took the deputy leader's post unopposed as well. Before Labour's position in the polls improved, Cullen was also involved in an attempt to oust Helen Clark as party leader, which was not successful. The two do not appear to bear each other any resentment, however. Cullen has claimed to be happy with his position as second, saying that in terms of personality, he is "a number two sort of person". Many commentators agree, believing that Cullen's strength lies more in administration than leadership. Cullen delivering the 2008 budget press conference. Labour's electoral victory in 1999 resulted in Cullen becoming Minister of Finance. 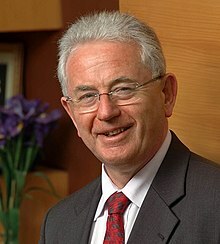 After the 2002 election, the electoral support for Labour's junior coalition partner (the Progressive Party) was not sufficient to justify its leader holding the Deputy Prime Minister position, resulting in Michael Cullen replacing Jim Anderton as Deputy Prime Minister. In 2004 Cullen declared his support for the monarchy of New Zealand, he was "a sort of token monarchist in the Cabinet these days". However, in 2010 he repudiated that stance, taking the view that New Zealand should move towards a republic once the Queen's reign ends. In 2005 Helen Clark appointed Cullen to the post of Attorney-General following the election of Margaret Wilson as Speaker of the House. His appointment became controversial because of his non-legal background (only one other non-lawyer had previously held the post) and because of his previous criticisms of the judiciary, including of the Chief Justice Dame Sian Elias. His term in the position ended following the 2005 general election. However, with the resignation of David Parker in March 2006, Cullen took over the position again. He had a reputation as one of the Labour Party's best parliamentary debaters, and is known for his sometimes "acerbic" sense of humour. Dr Cullen presented his seventh budget in 2006 as Minister of Finance. Cullen's guiding principle was, he stated, "The fool who spends on the upturn will find himself broke on the downturn". Labour's eighth budget in 2007 reduced company tax from 33% to 30% and introduced a 15% research and development tax credit. It also made a number of changes to the KiwiSaver scheme. The New Zealand economy entered recession in December 2007. Cullen's final budget was delivered in this context in May 2008; it reduced income tax on the first $9,500 earned from 15% to 12.5%, and the company tax rate from 30% to 29%. The day after the defeat of Labour in the 2008 general elections and Helen Clark's resignation as party leader, Cullen announced his resignation as deputy leader of the Labour Party. When he resigned from Parliament in 2009 he was replaced as an MP from the party list by Damien O'Connor. ^ "Cullen leaves politics for NZ Post role". The New Zealand Herald. 7 April 2009. ^ J., Cullen, M. (1971). "Social statistics in Britain 1830 - 1852". ^ "Hon Dr Michael Cullen". New Zealand Parliament. Archived from the original on 1 November 2007. Retrieved 5 December 2007. ^ "Otago to confer honorary degrees on Michael Cullen, Trevor Scott". University of Otago. 9 December 2009. Retrieved 31 December 2009. ^ "The Queen's Birthday and Diamond Jubilee Honours List 2012". New Zealand Honours Lists. Department of the Prime Minister and Cabinet. Archived from the original on 4 June 2012. Retrieved 30 June 2012. ^ Kirk, Jeremy (12 June 1996). "Clark secure as rebels pledge fealty; Cullen picked as Caygill quits". The Press. ^ "Cullen: New Zealand should be republic". Herald on Sunday. 29 August 2010. Retrieved 29 August 2010. ^ "Richard Worth: Cullen appointment degrades office of Attorney-General". NZ Herald. 5 January 2005. ISSN 1170-0777. Retrieved 20 February 2018. ^ Noted. "Court marshal - The Listener". Noted. Retrieved 20 February 2018. ^ "Government announces $1.3b boost for transport". The New Zealand Herald. 18 May 2006. Retrieved 20 March 2015. ^ a b "Budget 2007 tax announcements". IRD. 17 May 2007. Retrieved 24 March 2015. ^ "KiwiSaver Savers Fact Sheet Q&A" (PDF). IRD. 17 May 2007. Retrieved 24 March 2015. ^ "How bad is the Current Recession? Labour Market Downturns since the 1960s". Ministry of Business, Innovation and Employment. Archived from the original on 15 December 2014. Retrieved 15 December 2014. ^ a b "Budget 2008 - Tax Changes". 22 May 2008. Retrieved 24 March 2015. ^ "Cullen resigns after election defeat". The New Zealand Herald. 9 November 2008. Retrieved 9 November 2008. Wikimedia Commons has media related to Michael Cullen.